Can Berries Lower Heart Attack Risk? 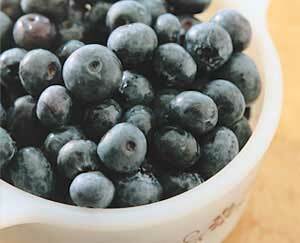 Can Flavonoid-Rich Foods Protect Your Heart? Eating berries as part of a healthy diet may be more important than you think. A study in Circulation suggests that women who eat plenty of blueberries and strawberries may lower their risk of having a heart attack. In this study, researchers looked at the link between health-promoting compounds called flavonoids, which are found in certain foods such as berries, and risk of heart attacks. Participants were 93,600 healthy women (ages 25 to 42 years) who were enrolled in the Nurses’ Health Study (NHS) II. For 18 years, researchers tracked the amount of flavonoids the women ate and the number of heart attacks they experienced. Women who ate the most anthocyanins, a type of flavonoid, had as much as a 32% lower risk of a heart attack compared with women who ate the least. There was a trend toward a lower risk of heart attack in women who ate more anthocyanins each week (consumed as three servings of blueberries and strawberries combined) compared with women who ate one serving or less a month. The authors recommend further research on common anthocyanin-rich foods to confirm their findings and determine the amount of berries needed over what amount of time to be most protective. Why flavonoids? Flavonoids have been linked to lower inflammation, improved function of blood vessels, and reduced cell damage. Prior studies have also shown that flavonoids may have heart-protecting effects such as lowering blood pressure and improving how the body handles sugar (glucose). What foods contain flavonoids? Anthocyanins, the type of flavonoid described in this study, are commonly found in the red and blue skin of fruits and vegetables such blueberries, strawberries, eggplant, blackberries, and others. Other flavonoids are found in many types of food and in beverages such as tea and wine. Should I eat more berries? Eating berries may be one important part of a healthy, balanced diet to prevent disease and optimize health. However there are many important steps you should take to prevent heart disease, such as talking with a doctor about your health, family history, and appropriate screening tests for blood pressure and cholesterol levels; talking with a healthcare professional about a diet that is right for you; not smoking; and exercising regularly based on your doctor’s recommendations.